Monitor Audio SoundFrame 1 review | What Hi-Fi? The Monitor Audio SoundFrame 1s are sensible value: they're £450 each, which includes standard white or black grilles. Optional block-colour grilles are £50 each, artwork grilles £100, and custom grilles £200. These are well-made, well-finished units, too, with thoughtful details that make them the easiest of all three models on test here to mount on the wall. A neat channel near the bottom accepts the cables, and the chunky binding posts are mounted on the front. That leaves the rear of the speaker completely smooth, and allows for a flush-to-the-wall installation. And that's not all that's clever. 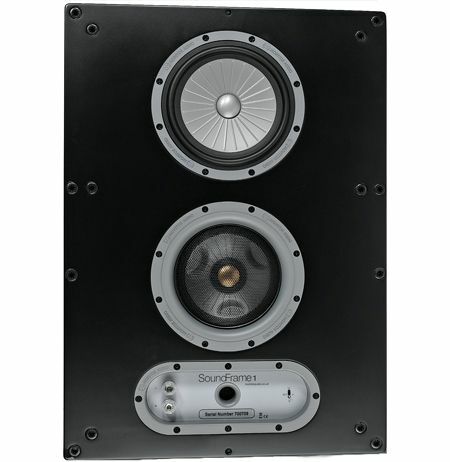 The SoundFrame 1s are three-way designs with sealed-box enclosures, and their drivers use many solutions familiar to fans of the company's conventional speakers. So, the 16.5cm bass driver is a RST-profile unit that uses surface dimples to aid rigidity, while the midrange and tweeter configuration uses the company's Inverted Dual Concentric (IDC) arrangement. This places a 25mm C-CAM gold-dome tweeter at the heart of an inverted 102mm midrange driver, with the entire assembly allowing for up to 18 degrees of pivot so you can aim its sound at your listening position. The SoundFrames have the most limited bass when compared to rivals such as Image Audio's IA8 and PMC's Wafer 2 (due to their sealed-box design), but they're still far from lightweight. They'll surprise with the reach and agility of their bass, while their clever drive unit arrangement ensures that imaging, even when the speakers are some way above your seat, is excellent. The presentation is impressively smooth too, even with grilles off and some brittle recordings – The White Stripes, for example – loaded into our reference Naim kit. Weaknesses? That slight lack of bass presence aside, you'll occasionally perceive a little midrange 'bloom' with some instruments, which translates into a slightly congested presentation with some complex rhythms. But it isn't a major flaw, and there are some conventional speakers with similar characteristics – but if timing is your thing, you might find the SoundFrame 1s can become a little muddled at times. Then again, used in a multichannel context, where their bass will be reinforced by a subwoofer and, perhaps, their midrange might be moderated by a home cinema receiver's calibration and equalization – we can't see any reason not to select the SoundFrame 1s. In any case, at the price they're an attractive proposition.